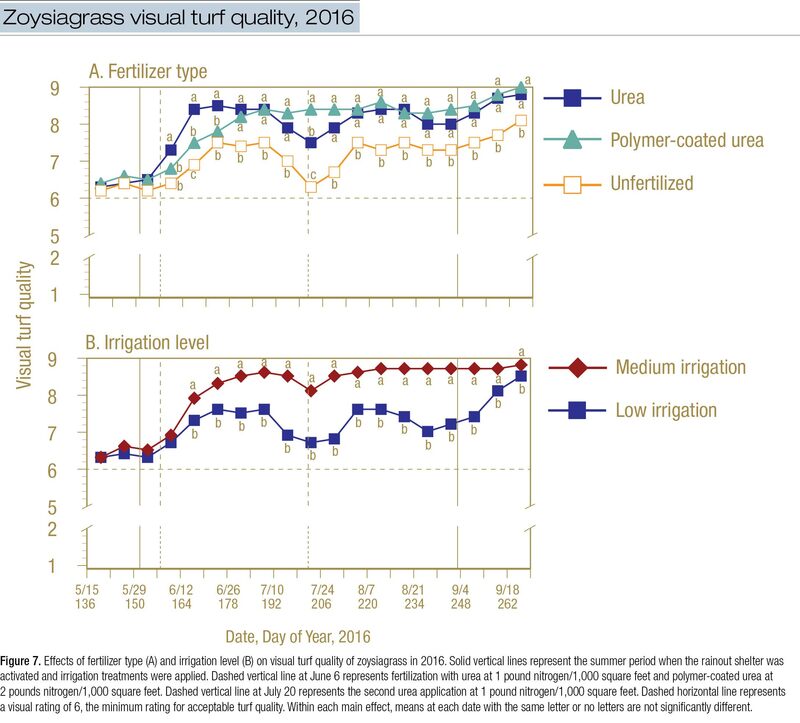 Use of controlled-release fertilizers and improved irrigation techniques may produce better visual turf quality while reducing nitrous oxide emissions. Dec 2018 | Ross C. Braun, Ph.D., and Dale J. Bremer, Ph.D.
Editor’s note: This research was funded in part by the United States Golf Association. The goal of a nitrogen fertilizer program should be to optimize plant uptake while minimizing nitrogen losses, such as runoff, leaching and gaseous losses. As stewards of the environment, golf course superintendents should understand how nitrogen moves in the environment and be aware of the importance of preventing nitrogen fertilizer from contaminating groundwaters and surface waters through leaching and runoff. They should also be aware of reducing gaseous losses of nitrogen. No single nitrogen fertilizer program is best for all turf. Nitrogen fertilizer programs will vary by turf species, especially between cool- and warm-season grasses, and among soil conditions (for example, soil type, properties, pH, slope, soil water content and soil temperature) and site conditions (for example, environment, climate and site use). Therefore, an effective nitrogen fertilizer program incorporates information about the soil and site conditions, the appropriate nitrogen amounts and timing of application, and what happens to the nitrogen fertilizer once it is applied to the turf. Plants absorb nitrogen as both nitrate (NO3-) and ammonium (NH4+), and preference for either varies by age and type of plant, environment, and other factors. In the turf industry, most of the nitrogen fertilizer is applied as urea, which is quickly converted to ammonium by urease, an enzyme found in soils and on the turf. Does all the nitrogen fertilizer applied get taken up by the plant? No. Why not? Because at the time of fertilizer application, multiple environmental factors and management practices may influence the nitrogen processes on the turf and in the soil, and these practices may result in the loss of nitrogen through multiple nitrogen pathways in the soil-plant-atmosphere system (Figure 1, above). One of these nitrogen pathways is denitrification, the process by which denitrifying bacteria convert nitrate into dinitrogen (N2), nitric oxide (NO) and nitrous oxide (N2O) gases, which are all released into the atmosphere. Nitrous oxide, an important greenhouse gas associated with global climate change, is reportedly 310 times more effective than carbon dioxide (CO2) at trapping longwave radiation (that is, heat) in the atmosphere, and it is, potentially, the gas that is responsible for the greatest depletion of ozone (6, 10). From 1990 to 2005, agricultural activities (nitrogen fertilization and soil management) have increased worldwide nitrous oxide emissions by 17% (6, 12). Applications of fertilizer to agricultural land — including turfgrass systems (4, 7, 8) — are responsible for a significant percentage of the nitrous oxide emitted into the atmosphere each year (9). Denitrification typically occurs under anaerobic conditions — wet soil conditions with an absence or limited amount of free oxygen. Therefore, an increase in soil moisture during or after nitrogen fertilization may significantly amplify nitrous oxide fluxes. Past research in turfgrass has shown nitrous oxide emissions typically increase after nitrogen fertilization (especially with quick-release fertilizers) that is followed by precipitation or irrigation (1, 4, 7, 8). Turfgrass researchers measuring nitrous oxide emissions have concentrated mainly on quick-release fertilizers, and few investigations have looked at the influence of controlled-release (slow-release) fertilizers on nitrous oxide emissions. The use of controlled-release fertilizers, such as polymer-coated urea (PCU) or sulfur-coated urea (SCU), may reduce emissions by decreasing the amount of nitrogen in the soil that is available for denitrification (11). Therefore, in order to develop management practices that have the potential to reduce nitrous oxide emissions in turfgrass, further research is required on the effects of the amount of irrigation and the different forms of nitrogen fertilizer on nitrous oxide emissions (2). We hypothesized that employing smarter turfgrass management practices such as combining the use of controlled-release fertilizers with improved irrigation techniques (for example, deficit irrigation) would reduce N2O emissions. We conducted a two-year field study under an automated rainout shelter at the Rocky Ford Turfgrass Research Center in Manhattan, Kan., from 2014 to 2016 (Figure 2, below). By shielding turfgrass from rainfall, we were able to control the amount of water applied to research plots. Our experimental objectives were to quantify the magnitude and patterns of nitrous oxide emissions in turfgrass, and to determine how irrigation and nitrogen fertilization may be managed to reduce nitrous oxide fluxes. Because visual quality of turfgrass is important to golf course superintendents, we also evaluated the effects of the treatments on turfgrass appearance. Our experiment included 36 plots arranged in a 2 (irrigation) × 3 (fertilizer) treatment factorial in a randomized, complete-block design with six replications. Our turf plots were Meyer zoysiagrass — commonly used for golf course fairways in the transition zone — maintained to simulate golf course fairway conditions (Figure 2). We applied two deficit irrigation treatment amounts: medium (66% reference evapotranspiration [ETo] replacement) and low (33% ETo replacement). During the summers (June-August) of 2014, 2015 and 2016, the two irrigation treatments were applied by hand-watering individual plots twice a week using calculated amounts from daily ETo rates from an on-site weather station (Figure 3). When the rainout shelter was not activated (September-May), the plots all received adequate irrigation (≤ 0.5 inch/week) and any occurring precipitation. We applied three fertilizer treatments: 1) a controlled-released, polymer-coated urea (PCU) (41-0-0; 90-day release, Polyon, Koch Agronomic Services) applied once at the beginning of summer for a total of 2 pounds nitrogen/1,000 square feet/year (97.6 kilograms/hectare); 2) a quick-release urea (46-0-0; Thrive Branded Fertilizer, Mears Fertilizer) applied at a rate of 1 pound nitrogen/1,000 square feet (48.8 kilograms/hectare) at the beginning of summer and again at midsummer for a total of 2 pounds nitrogen/1,000 square feet/year; and 3) an unfertilized “control” receiving no nitrogen fertilizer. After fertilization, plots were individually hand-watered as described above with respect to the corresponding irrigation treatment to incorporate fertilizer into the soil and reduce ammonia (NH3) volatilization. Figure 3. Plots received precise irrigation amounts based on daily reference evapotranspiration during the summer (June-August). Figure 4. Twelve static chambers (right side) were used for sampling nitrous oxide across 36 plots on each measurement date. To sample a plot, a static chamber was installed on the base collar (left side), creating an airtight seal with closed-cell weather stripping and a rubber sleeve covering the outside perimeter of the junction (right side). Gas samples of 25 milliliters were extracted with syringes and injected into 12-milliliter vials at 0-, 20- and 40-minute intervals. We measured soil-surface nitrous oxide fluxes from October 2014 through October 2016 using static, vented polyvinyl chloride chambers and gas chromatography (Figures 4, 5). Fluxes of nitrous oxide were measured at least once weekly during the growing season from May through September, and once every two to four weeks during winter dormancy from October through April. Measurements were more frequent surrounding fertilization events in the summer, such as one, three, five and seven days after nitrogen fertilization. Ancillary measurements of soil moisture, air and soil temperature, soil NO3 and NH4, and visual turf quality were also collected during the study. Overall, the highest nitrous oxide fluxes and majority of nitrous oxide emissions occurred during summer, which is in agreement with previous research (4, 5, 8). Presumably, this is because of higher soil temperatures (data not shown; see reference 3 for more information), which stimulate soil microbial activity. However, in the case of warm-season grasses such as zoysiagrass, nitrogen fertilization in the transition zone occurs during the summer, and nitrogen fertilization contributes significantly to nitrous oxide emissions (8, 9). Therefore, in terms of nitrous oxide emissions, it is important to examine summer irrigation and nitrogen management practices. When plots were irrigated (during the two summers), cumulative nitrous oxide emissions were reduced by 6% with less irrigation (33% ETo) (Table 1). This demonstrates that less irrigation reduces nitrous oxide emissions and, therefore, that reducing irrigations not only saves water, but also reduces greenhouse gas emissions. In terms of nitrogen fertilization effects, cumulative nitrous oxide emissions over the two summers were highest in plots fertilized with quick-release urea, lowest in unfertilized plots, and intermediate in PCU plots. 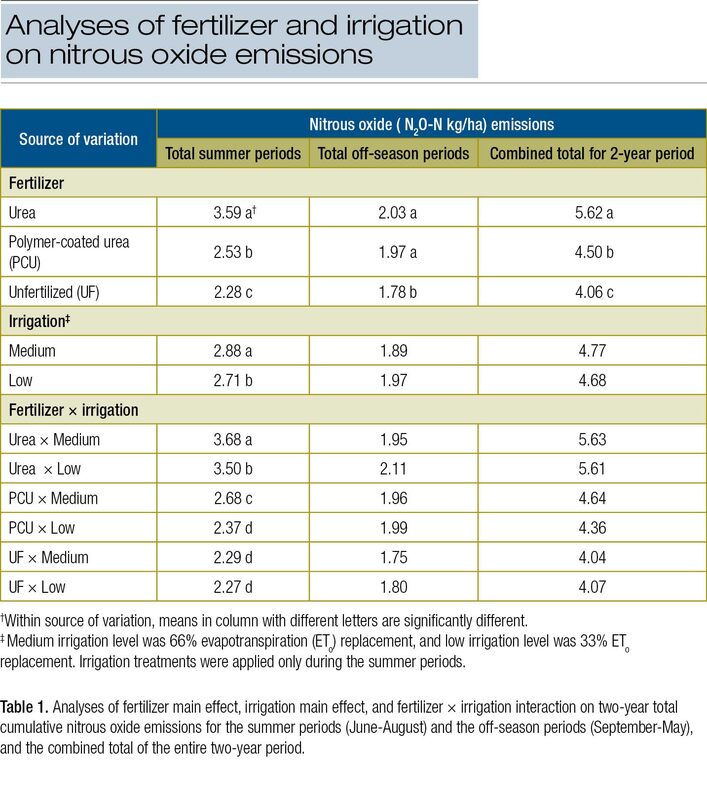 In both fertilized treatments (urea and PCU), reducing irrigation also reduced nitrous oxide emissions (Table 1). Interestingly, emissions were always higher with urea than with PCU, regardless of irrigation rate. This indicates that using PCU reduces nitrous oxide emissions more than reducing irrigation in urea-fertilized plots. Irrigation level did not affect nitrous oxide emissions in unfertilized plots (Table 1), but over the two summers, nitrous oxide emissions were as low in PCU at low irrigation as they were in unfertilized plots at both irrigation levels. This is significant because it indicates the combination of fertilization with PCU and less irrigation could reduce nitrous oxide emissions to levels similar to those found in unfertilized turfgrass. The primary mechanism that produces lower nitrous oxide emissions in plots treated with PCU compared with those treated with urea seems to be related to fertilization events. Namely, after application of quick-release urea fertilizer, there were large spikes in nitrous oxide fluxes, but these spikes in fluxes were negligible after application of controlled-release (PCU) nitrogen fertilizer, which was less affected by soil conditions (for example, soil moisture) at time of application (3). Overall, reductions in nitrous oxide emissions are likely a result of slower nitrification and denitrification processes in soils associated with less irrigation and controlled-release forms of nitrogen fertilization. For overall cumulative nitrous oxide emissions, the type of fertilizer had a significant effect in both years and during the entire two-year period, but the amount of irrigation did not have a significant effect during the entire two-year period (Table 1, Figure 6). The overall lack of effect of irrigation was contrary to results previously mentioned for cumulative summer nitrous oxide emissions. This was likely due to the absence of irrigation treatments during the remainder of either year (that is, the “off-season,” when all plots received identical irrigation and precipitation for nine months of the year), which diluted the overall effects of the irrigation treatments over the entire study. Conversely, the fertilizer treatments, which were also applied only during the summer, had more frequent and more pronounced differences between treatments than the irrigation treatments (data not shown), which led to annual cumulative differences. Figure 5. A nitrous oxide measurement date during the summer using static chambers mounted on base collars in the soil. A single measurement date required 20 hours, which consisted of evacuating collection vials, collecting ancillary measurements and nitrous oxide measurements, and then transporting the vials back to the lab for analysis with a gas chromatograph. 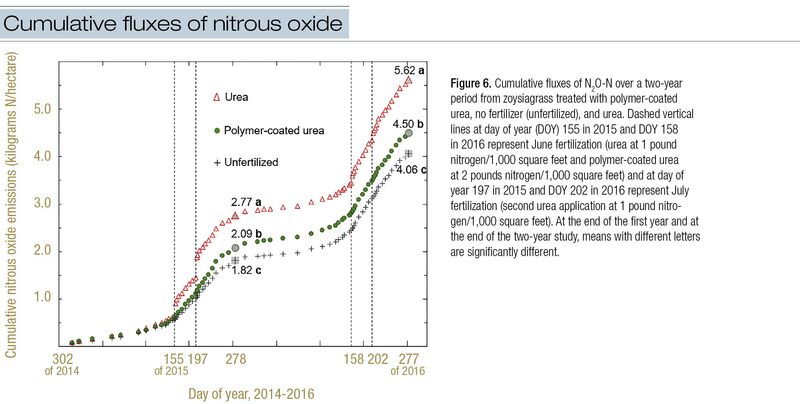 Over the entire two-year period, total cumulative emissions of nitrous oxide were increased by 38% with urea fertilization and by 11% with PCU fertilization, compared with unfertilized turf (Figure 6). Compared with urea, nitrous oxide emissions were reduced by 20% using PCU-treated turf and by 28% in unfertilized turf in this study. The range of emissions (1.82 to 2.85 kilograms N2O-N/hectare/year) in this study is comparable to the average rate of 2.7 kilograms N2O-N/hectare/year reported from other turfgrass systems, which is similar to rates in agricultural soils (2). Our results indicate the use of a controlled-release fertilizer such as PCU should be encouraged because it significantly reduces nitrous oxide emissions in turfgrass compared with the use of quick-release fertilizer. Both urea and controlled-release nitrogen fertilizer treatments produced higher turfgrass quality than the unfertilized control. Surprisingly, however, all treatments maintained acceptable turfgrass quality (≥ 6) in both years, including zoysiagrass receiving only low irrigation (33% ETo) twice a week with all rainfall excluded for 92 days during the summer in Kansas in 2015 and 2016 (Figure 7). Even though the visual quality increased more slowly, PCU-treated plots generally sustained higher visual quality than urea-treated plots over a longer period during the summer (Figure 7). Therefore, besides reducing nitrous oxide emissions, the controlled-released PCU fertilizer produces more consistent turf quality over the summer compared with the quick-release urea fertilizer. The development and application of the smarter management practices presented in this article may reduce nitrous oxide emissions from turfgrass systems and help mitigate climate change and atmospheric ozone destruction. They could also conserve water and improve consistency of turf quality throughout the growing season. Additional research is required into, for example, nitrogen amounts, seasonal application timings, and differences between warm- and cool-season turfgrass species using controlled-release fertilizers, combined with different irrigation timings and quantities surrounding nitrogen fertilization, to minimize nitrous oxide emissions and maximize plant nutrient uptake. Overall, golf course superintendents could benefit from using controlled-release fertilizers such as PCU rather than quick-release fertilizers such as urea, and from keeping irrigation to a minimum in order to reduce the amount of applied nitrogen lost to the environment, increase nitrogen availability to the turf, and conserve water. This work was supported by the United States Golf Association (USGA) project 2013-21-482 and the Kansas Turfgrass Foundation. The authors thank Andrew McGowan, Eric Miltner, Pavithra Pitumpe Arachchige, Noortje Notenbaert, Kalli Morland, Jordon Webster and Cliff Dipman for assistance with this project. The full manuscript summarizing how turfgrass systems contribute to the global greenhouse gas budget is available in Agronomy Journal, and the experiment on nitrous oxide emissions from turfgrass receiving different irrigation amounts and nitrogen fertilizer forms is available in Crop Science. Compared with quick-release fertilizers, controlled-release fertilizers such as polymer-coated urea (PCU) may reduce emissions of N2O from turf by possibly reducing the amount of nitrogen in the soil that is available for denitrification. In our study of Meyer zoysiagrass maintained as a fairway, N2O emissions were greatest in plots fertilized with urea, lower in plots treated with PCU, and lowest in unfertilized (UF) plots. Irrigation levels had no effect on N2O emissions in UF plots, but emissions were as low in PCU plots receiving low irrigation as they were in UF plots. Both urea- and PCU-treated plots had higher visual turfgrass quality than UF plots, but visual quality was acceptable in all cases. Gillette, K.L., Y. Qian, R.F. Follett and S. Del Grosso. 2016. Nitrous oxide emissions from a golf course fairway and rough after application of different nitrogen fertilizers. Journal of Environmental Quality 45:1788-1795. IPCC. 2007. Climate Change 2007: Synthesis Report. Contribution of Working Groups I, II and III to the Fourth Assessment Report of the Intergovernmental Panel on Climate Change. Core Writing Team, Pachauri, R.K., and A. Reisinger, eds. IPCC, Geneva, Switzerland, p. 104. Lewis, J.D., and D.J. Bremer. 2013. Different nitrogen management regimes affect nitrous oxide emissions among one cool-season and two warm-season turfgrasses. International Turfgrass Society Research Journal 12:31-38. Smith, P., D. Martino, Z. Cai, D. Gwary, H. Janzen, P. Kumar, B. McCarl, S. Ogle, F. O’Mara, C. Rice, B. Scholes and O. Sirotenko. 2007. Agriculture. Pages 497-532. In: B. Metz et al., eds. Climate Change 2007: Mitigation. Contribution of Working Group III to the Fourth Assessment Report of the Intergovernmental Panel on Climate Change. Cambridge University Press, Cambridge, U.K., and New York. Ross C. Braun is a postdoctoral research assistant in the Department of Horticulture and Landscape Architecture at Purdue University, West Lafayette, Ind., and Dale J. Bremer is professor of turfgrass science, graduate program director in the Department of Horticulture and Natural Resources at Kansas State University, Manhattan, Kan.